While it’s easy to think that everyone simply uses a tablet or laptop to read these days, you’d be shocked by how many clients we’ve helped move their rather large book collections. After all, whether helping a client in their twenties move into their first apartment along with the books they amassed at college or helping clients move who are in their thirties and up who might be in grad school and have even more books, we’ve handled all types of book-related moving situations. Of course, it’s not just students or academics that have book collections. When it comes to packing books, however, it seems no one is an expert as we’ve had our share of poorly constructed boxes from clients give out while loading a whole big box full of books onto the truck. Below we break down the best practices for packing books when moving in Chicago. Like you would protect any collection of valuables in your house, it is best to first go through all the books you have, taking them off the shelves to get an idea of how much space they take up while also identifying books that you’re never going to read again. It’s too easy to make moving far harder than it need be just by packing ten books in a box instead of five. And while we’re not saying you have to cut your book collection in half, you should at least trim it down to make your life easier. Additionally, as book owners are often particular about how they store their books, organize them as you would on your shelf. Be it alphabetically or by subject, try and keep your books as they are currently organized. That way when it comes to setting up your books in your new home, you don’t have to re-organize them from scratch. As you’ve likely gathered through first-hand experience, moving books is heavy business. A box of twenty or thirty boxes can weigh close to the three-digit range and thus you’re going to need sturdy boxes that can hold all that weight. What you need are “book boxes,” which are boxes that are made of thick cardboard and are typically small with the dimensions of 20’’ x 11’’ x 11.’’ Lastly, they should be brand new so as to ensure that they have had no wear or tear. You can purchase thick medium boxes from our packing store or at your packing materials store of choice. 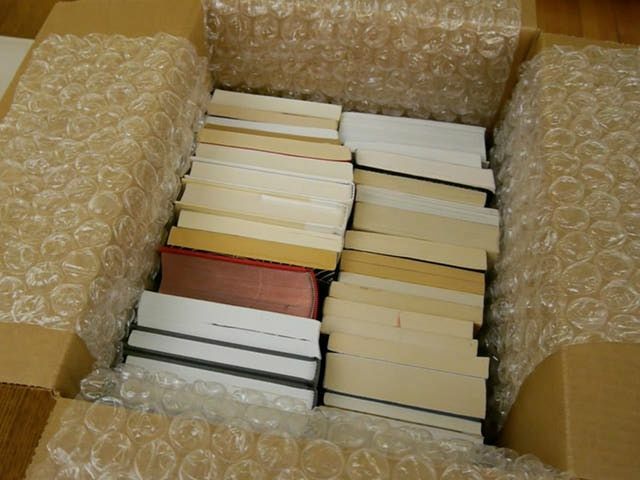 Additionally, you will need packing paper, newspapers, or bubble wrap to fill in the negative spaces created by the books and to wrap them all up in, packing tape, and most of all a marker and smart labeling to keep track of all of the different sections of your book collection. When it comes to collections, there’s no such thing as overdoing it with labeling as the more clear you are on the contents of a box, the easier it is to unpack. OK, so we’ve organized our books for packing and gotten the materials we need, now it’s just a matter of packing the books so as to make use of as much space as possible without overdoing it. And if you’re packing any books of value, wrap them individually in soft packing paper and consider keeping them with you during the move, especially if they have significant sentimental value. When it comes to actually packing your books, you can do so three different ways: upright, flat, or spines down. Flat is the most common method as you can just stack them along the box sides while placing the heavier volumes at the bottom of the box. Spines down can seriously damage the spines of you book and upright–like how you would see them arranged on a bookshelf–should never be done with the open sides facing the inside of the box. Truly, flat is the way to go and while you may lose some of your organization to the need to stack according to size, you’ll still be grouping your books according to your organizational system so you will be cutting down significantly on setting everything back up.